Traveling to Napa Valley can be a fun and enlightening experience. Not only you get the see the scenic landscape, you will also have the opportunity to taste wines, and learn the process of winemaking. 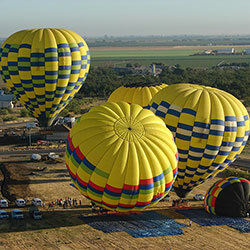 Balloons Above the Valley (BATV) offers a variety of Napa wine tour packages to consider. This is a basic BATV package that costs $209 per head. Guests will meet at the lobby of the Napa Valley Marriot to enjoy a freshly-made pre-flight breakfast and coffee. And then after the glorious hot air balloon ride over the vineyards and the valleys, they will be transported back to the Napa Valley Marriot for a champagne brunch where they will celebrate with other guests the amazing and successful just-concluded flight. If you want to do some actual wine tours in addition to the hot air balloon flight, and then this package should answer your desires! At $608 per two persons, you and your companion will visit 4-6 premium wineries. BATV’s tour partner, Napa Valley Wine Country Tours, will be the one to choose the wineries and try to choose the ones that would be the most appealing to you. Enjoy a buffet-style picnic lunch, and go on a tour with style inside one of the Napa Valley Wine Country Tours’ limo buses. You also have the option to choose the wine tours immediately following the hot air balloon ride, or on the next day. Want to go on a grand getaway in the Napa Valley for only $836 for two? Then choose the San Francisco Balloon and Wine Tour Package! This is also perfect if you’re going to stay in the San Francisco downtown but decide to visit the wine country. This two-day package consists of a seven-hour wine tour that begins in the SF downtown on a bus limo from Napa Valley Wine Country Tours, includes an on board-breakfast with mimosa, visits to two wineries in Napa and two in Sonoma, a picnic-style lunch, an olive-oil tasting, and the hot air balloon ride on the next day. Of course, you will also get to enjoy a delicious breakfast before the flight and a lovely and delicious champagne brunch after the flight. And that’s not all! If you elect to do some shopping after the post-flight brunch, our chauffeur will drop you off at either the Oxbow Public Market or The Napa Valley Premium Outlets, before being transported to the Ferry Terminal in Vallejo to take you back to San Francisco. Or you have to option to be driven to the Ferry Terminal directly after the post-flight brunch. For those who don’t want to be a part of the flying party, one guest can choose the chase and brunch package. They will not join the other guests on the hot air balloon, but will follow the hot air balloon from the ground. Guests choosing this option will enjoy the pre-flight breakfast and post-flight brunch with their friends. Apart from Napa Country Wine tours, guests will also have the option to tour other wineries by other means. The Platypus Wine Tours will take you to the more backcountry vineyards and wineries for a more laid-back, intimate, and surely unforgettable wine tours experience in Napa and Sonoma Valleys. Traveling in the Wine Country is not complete without taking a ride on a cable car. The Napa Valley Wine Trolley has a fleet of free-moving motorized vehicles, modeled after the iconic San Francisco cable cars, which will take guests to the vineyards and wineries. Guests will also enjoy wine tasting at some of the Napa’s premium wineries, and a catered lunch. BATV also offers hot air balloon rides for the kids, as well as exclusive flights, weddings and proposals, as well as group and company tours. Prices may change without prior notice, so it’s better to contact us to learn about the reservations details: 800-464-6824 or info@balloonrides.com. Choose any of the competitive Napa Wine tour packages from Balloons Above the Valley. They’re guaranteed to give you the fuss-free luxury and the best sights and tastes of Napa without spending a lot!